The recalled utility vehicles were sold in red and have one or two rows of seats and a rear box. 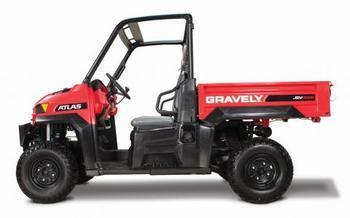 “Gravely” is printed on the rear box, and “Atlas” is printed on the hood of the utility vehicle. The model and serial number can be found on the driver’s side and are visible from the front wheel well. The utility vehicles, manufactured in the U.S., were sold at Gravely dealers nationwide from September 2014, through July 2018, for between $13,000 and $15,700. Consumers should contact an authorized Gravely dealer for a free repair. If the exhaust system becomes noisier, consumers should immediately stop using the recalled utility vehicles. Gravely is contacting all known purchasers directly. Consumers may contact Gravely at (877) 740-7060 from 8 a.m. to 4:30 p.m. (ET) Monday through Friday, or online at www.gravely.com and click on the Product Support link at the bottom of the page, then select Product Safety Recall in the menu on the left of the page for more information.